About 340 people in five areas of England were turned away from voting in council elections because of a pilot scheme requiring proof of identity. At least 688 were initially stopped but later returned to the polling station with the correct documents. 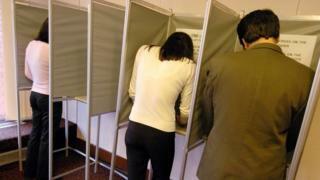 The government said an "overwhelming majority" of voters had the right documents. Bromley, Gosport, Swindon, Watford and Woking councils tried out asking voters to present ID. In Bromley 154 were unable to vote, in Watford 66 could not vote - initial figures had showed the number was 64. In Woking it was 51, in Gosport it was 44 and in Swindon 25. A breakdown of the data published by Woking Borough Council showed a driving licence was the most common form of ID used. It was presented by 11,282 out of 18,735 voters at its polling stations. Just 43 people in Woking used a local elector card, which was offered by the council for free to anyone who did not have other acceptable means of proving their identity. Ray Morgan, Woking Borough Council's returning officer, said: "Given that 99.73% of voters brought a correct form of ID and engaged positively with the pilot and only 0.27% did not, I think we can call this trial a great success. "Following our experiences in the polling stations on 3 May, I see no reason why bringing ID to vote cannot be embedded in our democratic process and have already expressed my desire to the Cabinet Office that Woking continues to participate in any future trials." A spokesman for the Electoral Reform Society said: "Unfortunately we'll never know how many blameless voters stayed home or turned back before they even got to the polling desk in these trials, but any number is too high. These people would not have come into contact with polling station staff and therefore are not included in any official data. "The local elections showed these trials to be the chaotic, undemocratic mess many predicted, with honest voters denied their democratic right to take part. They must not be used as an excuse to impose this flawed scheme across the UK." The pilot tested different requirements in different areas. In Swindon and Watford, people only needed ID if they did not bring their polling card with them. In Gosport people could use photo ID such as a driving licence or passport or two other forms of ID, such as a birth certificate or recent utility bill. Bromley council said turnout compared "favourably" with previous local elections. Chief executive and returning officer Doug Patterson said: "Though we have no reported voter fraud in the borough at present, I am proud that the council and the people of Bromley have helped the Cabinet Office look at how the integrity of our voting system can be maintained into the future." A government spokeswoman said the "overwhelming majority" of voters had the right documents and were "not adversely affected". She said: "The success of the voter ID pilots proves that this is a reasonable and proportionate measure to take and voters were fully aware of the changes on polling day. "We will evaluate the pilots before announcing the next steps in delivering voter ID nationally."